« Hyperthermia in the Heat? Sometimes rain will send us running for cover but sometimes we seem to enjoy it. Most of the time we see a rainbow we are in the wrong place at the wrong time. Eventually we will be in the right place at the right time. When the sun light is coming from behind your camera while it’s raining overhead you’re chances of catching a rainbow are a lot better. Of course if don’t mind getting wet your luck could pay off. This entry was posted on October 22, 2010 at 7:31 am and is filed under Uncategorized. You can follow any responses to this entry through the RSS 2.0 feed. You can leave a response, or trackback from your own site. WOW! One of the best rainbow shots I’ve seen in a while! Great catch, Steve! This shot is really playing games with my mind with all the varying layers of light. Well done! 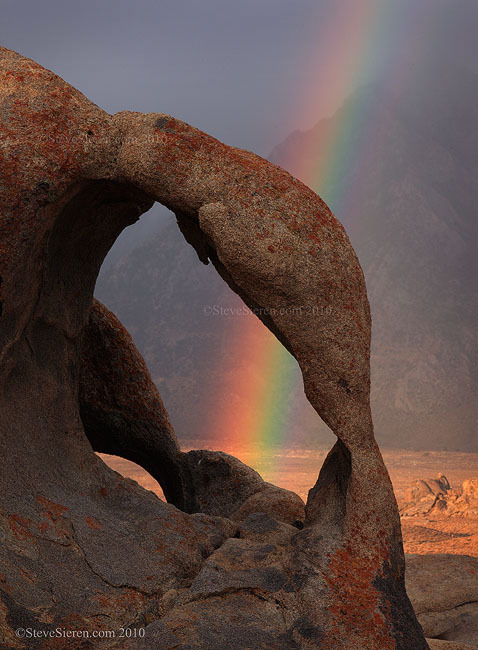 Steve… can’t think of a more interesting place to be when the light gets good than the Alabama Hills. Nicely done indeed! Thanks guys, I’ve never changed lenses so fast before! By the third shot it faded. Oh my, what a catch it is. Beautiful.